James Spann puts some sunshine back in the Alabama forecast from Alabama NewsCenter on Vimeo. BRIGHTER THIS AFTERNOON: A layer of stratus clouds has been very persistent across Alabama over the past few days, and they are still hanging over the state early this morning. But subsidence should take over later today as the sky becomes partly sunny, and we project a high around 50 degrees this afternoon. Tonight will be clear and cold with a low near the freezing mark, and tomorrow will feature a partly to mostly sunny sky with a high in the mid to upper 50s. THURSDAY/FRIDAY: A disturbance will bring clouds back into Alabama Thursday, and a few showers are likely Thursday afernoon and Thursday night. Moisture will be very limited with this feature, and rain amounts should be fairly light; the high Thursday will be in the upper 50s. Then, on Friday, the warming trend continues as temperatures rise into the 60s. A stray shower is possible Friday morning in spots; otherwise the day will be generally cloudy with only a limited amount of sun. SATURDAY: Clouds thicken again as the weekend begins, and a dynamic weather system will bring rain to our state Saturday afternoon and into Saturday night. Some thunder is possible, but we don’t expect any issues with severe thunderstorms because of the lack of instability. The main window for rain comes from about noon until midnight, and rain amounts of one-half inch to 1 inch are likely. It will be a mild day with a high in the 60s. COLDEST AIR SO FAR ARRIVES SUNDAY: Bitterly cold air rolls into Alabama Sunday with a strong north wind. Many communities north of Birmingham will stay below freezing all day, and the north wind of 15-30 mph will push the wind chill index into the single digits much of the day. A few snow flurries are possible after midnight Saturday night and Sunday morning as the Arctic air blasts into the state, but we expect no accumulation or impact. The cold air is the big story. The sky will clear Sunday night, and by Monday morning we project a low in the 10- to 20-degree range for north and central Alabama, easily the coldest morning so far this season. The day Monday will be sunny with a high in the low 40s. TO THE NORTH: Another high-impact snow event is likely this weekend in a broad zone from St. Louis and Chicago into the Northeast. It’s too early to be specific on placement and amounts, but travelers, beware. REST OF NEXT WEEK: Tuesday will be dry with a high in the upper 40s, and then we will bring in a chance of some rain Wednesday afternoon or Wednesday night. The chance of rain will linger into Thursday, and possibly Friday. 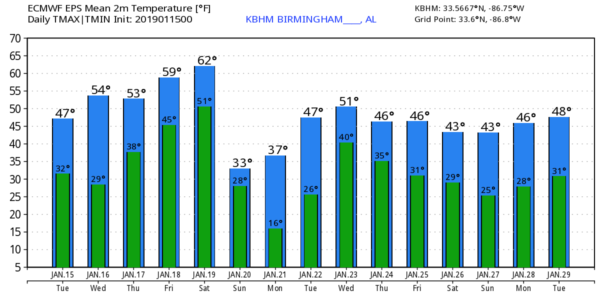 Thermal profiles suggest all liquid precipitation; there is no evidence of any significant snow or ice for Alabama for the next seven days, despite what you might read on Facebook.